This was the first time I ever encountered this face-detection feature, and it just so happened Facebook picked a particularly poor photo to introduce it with! 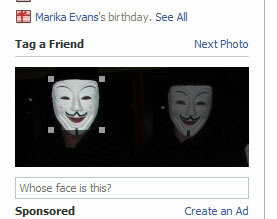 Clearly they’ve started using a face-detection algorithm to pinpoint probable candidates for tagging – unfortunately, the algorithm is easily fooled by V for Vendetta masks. The photo in question features four friends and we have no idea who is whom – it was a few years ago and we’re all identically clothed!